At Thermo Fisher Scientific I design and manage the creation of microsites, email campaigns and promotions, newsletters, landing pages and web forms. In addition, I’ve had the opportunity to contribute ideas to improve overall site content, navigation, organization, etc. including driving business clients to strategize marketing campaigns across both print and electronic media. As a team consisting of two other web content editors, I’ve also ensured that all content is reviewed, edited and published in a timely manner and according to established design standard, Internet best practices and information architecture standards and guidelines. 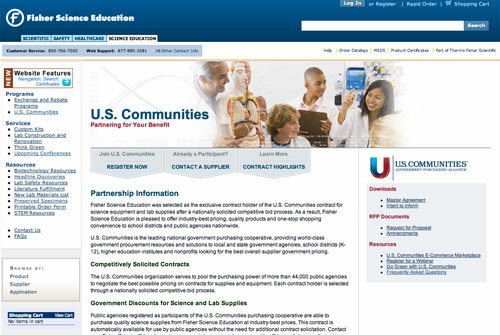 U.S. Communities: Offers industry-best pricing, quality products and one-stop shopping convenience to school districts and public agencies nationwide. Laboratory Safety: Through the expertise of trained safety specialists, this microsite offers more than 75,000 safety products to help minimize the risk of injury or illness to laboratory workers and protect against a variety of laboratory safety hazards. Contrary to the other examples listed here, I worked with a team consisting of a designer, developer and web content editor over a lengthy process to implement this microsite. Preserved Specimens: Provides the highest quality preserved specimens for classrooms from earthworms to pigs and everything in between. Headline Discoveries: This free digital magazine brings real-world science into classrooms through informative articles on current events in science, including classroom discussion points, and showcases innovative products that reinforce key concepts. Also see the Writing & Editing section for information on my editorial contributions to this publication. NeuLog Sensors: Offers state-of-the-art, next generation, data acquisition sensors. EMD Millipore: Provides cutting-edge technologies and tools for bioscience research and biopharmaceutical manufacturing, including protein research, sample preparation and water purification. 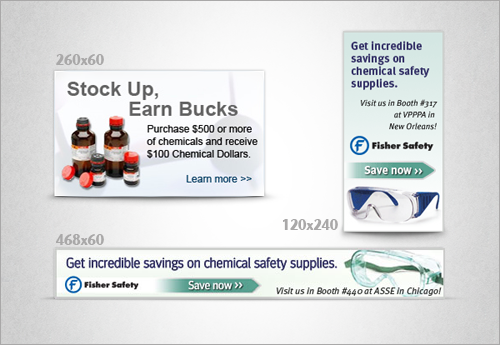 In addition to designing and developing microsites and landing pages, I also am asked to design banner ads both for the Fisher Scientific website, but also for external sites.